LineageOS 14.1 based on Android 7.1.1 Nougat custom ROM is available for the Galaxy S7. The Herolte Zip is still in the nightly mode, which means after installing this ROM, you will receive a regular update from Lineage team via OTA (Over-the-air). Since it is based on Android 7.1.1, you will get access to all the Nougat features by Google with several added tweaks. Your phone must be rooted and have a custom recovery (like TWRP) installed from before in order to flash this ROM. Read the tutorial below to get all the necessary steps to perform a clean flash on your Galaxy S7. If flashing is not a new task for you, this guide would not be much difficult. We have covered entire step-by-step tutorial so that a new user can perform the flash easily. NOTE: This tutorial is only for Samsung Galaxy S7. Do not try this ROM on any other variant of Galaxy Phones. This ROM comes with a lot of amazing features based on Android 7.x.x Nougat. A quick list of main features are given below, and we hope you would love to use it on your device. Split-screen works in both portrait and landscape mode, with the two ‘windows’, only being resizable in portrait mode. LIKE this Custom Firmware for Galaxy S7? We love it too and we know you are looking forward to install it on your phone. Please read the important information below before starting the tutorial. Make sure you have correctly installed Galaxy S7 USB Driver on your computer. If not, please download from any official source and install it correctly. Otherwise, your computer will not detect your device. 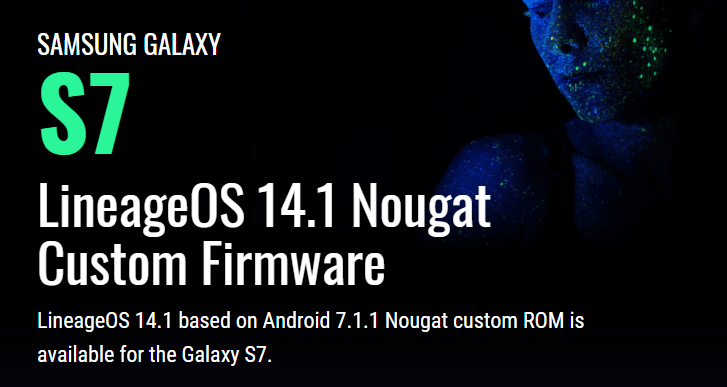 We have mentioned full step by step instructions on how to install LineageOS 14.1 Android 7.1.1 Nougat ROM on Galaxy S7. If you are entirely new for flashing a Custom ROM or an Official Firmware, please read the entire tutorial once before actually performing it on your device. Step 1: Download the latest LineageOS 14.1 Android 7.1.1 Custom ROM and GApps for Galaxy S7 on your computer. Step 2: Now, connect the device to your PC using USB Cable. Step 3: Copy and paste the downloaded zip file to the internal storage of your phone. Step 4: Switch Off your phone and disconnect the cable. Step 5: Press and Hold Volume Down + Power Button together to enter into the recovery mode! Step 6: Once you are in the TWRP recovery mode, perform a full data wipe by tapping on “WIPE” Button. Also, perform a factory reset by swiping on the “Swipe to Factory Reset” option at the bottom. Step 7: Go back to main menu (TWRP Home) and tap on “Install” button. From the list, choose the zip file that you have copied in Step 3. Step 8: Confirm the installation by swiping the “Swipe to Confirm Flash” option on the next screen. Step 9: Now, tap on the “Wipe cache/dalvik” button to clean the ROM and stay away from any boot loop issues. Google Apps: Repeat the above step (Step 7 to Step 9) for the Gapps zip file as well and install it on your phone. Step 10: Hit on “Reboot System” button! Wait a while, and your phone will not take more than 10 minutes to boot for the first time. Hurray! Your Galaxy S7 should now have LineageOS 14.1 Android 7.1.1 Nougat Custom Firmware. Go to Settings > About phone to verify.